Haru talks to Tsuyoshi about his new find from the garden, while Tsuyoshi closely listens(though the first photo makes it look as though Haru is goosing Yoshi while Yoshi tries to stop him… that would be very out of character of Haru if you asked me but it still makes me chuckle). Tsuyoshi is amazed that Haru can find such tiny little shells. He, himself has a very hard time even being able to see but Haru says that he has his ways. Plus he has several friends willing to help. He is going to pack this little shell up for a friend. The little guys are all wrapped up in various knits I made just for them. Photos were taken this weekend by the Mr for new tiny sized care instruction card I’m having made to send out with all of the tiny sweaters I sell for commissions and cons. This is the first time seeing Haru in one of the sweaters. He looks terribly cute in the white one so that he is keeping that sweater for sure. The pants were made for fun. I had originally tried to make the Elizabeth Zimmermann February baby leggings for them since the sweater had turned out so well scaled down. No matter what I did I could not get the pattern to work at the Yo-scale so I had to start from scratch. I’m really happy with the results. 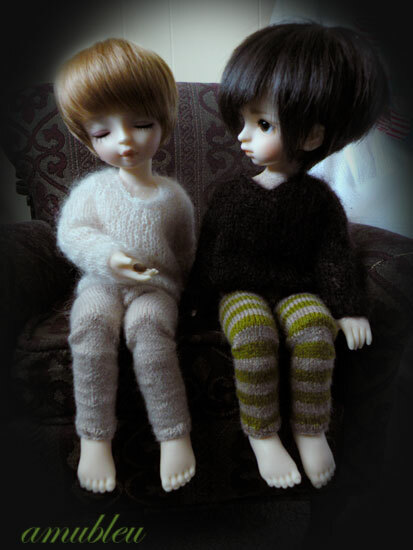 Haru is wearing the first pair I had made. I learned a lot from these and made a few adjustments before working on Tsuyoshi’s pair. 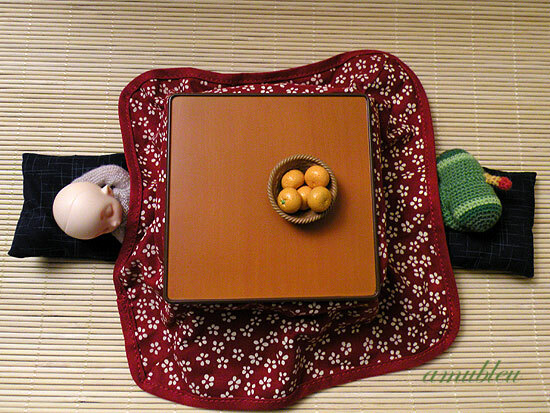 The great thing about them is the fact they don’t expose doll crack when they sit (this is thanks to some strategic short row workings… who said they were afraid of shorts rows?… me?… couldn’t have been). I worked them in a shorts version as well and I’ll be selling these at Otakon next month(these are so silly and cute). As for the pants I think I may add these to the commissions thread after the con. They are odd but are a lot of fun to make and you never know who will want a pair. This week has been soso and it’s cooled down quite a bit today despite the 90+ degree weather they claimed we were suppose to have (work was miserably hot tuesday and wednesday… I work in an old factory building with no ac at all). Working on Otakon this week after finishing up a long over due frustrating sweater (I blame my miscalculations on this one). I’m not throwing the towel in just yet on this one but there are a few issues I think I have to call it quits on that don’t involve knitting and dolls. Oh well. I’m updating this here this evening due to some amubleu.com issue… which I will get into in a moment. 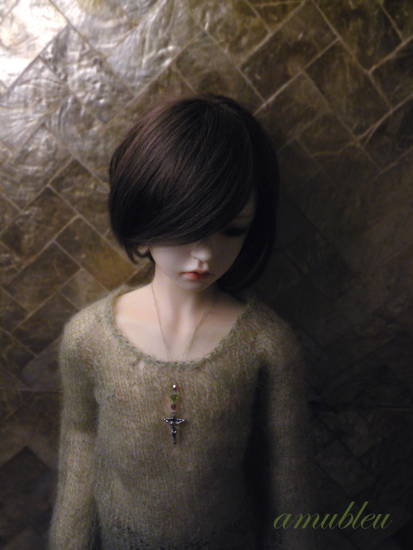 Last night I had made a post on the daily blog about picking Hito’s “owl” sweater up again. The post is gone from the main site but can still be seen here. 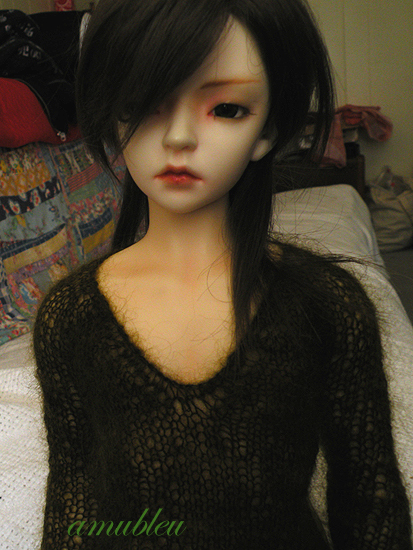 Anyway, after work and before going any further I decided to squeeze Hito into the sweater. So far so good. I’m really happy with how it’s finishing. I had mentioned not looking forward to the short rows. Mainly for the fact I was under the impression that they were more for decreasing than shaping but it’s the opposite(I really need to read directions before I start these things). It’s really to raise the neckline up… so… since this style is a bit more feminine than I wanted I’m skipping the short rows and going for more of a scooped or relaxed style neckline. If it was for me or for a female doll I would normally go for it. Instead I’m going to go right into the ribbing and hope for the best. I’m going to mark this last row before starting in case I change my mind. So amubleu.com was a bit buggy last night. The Mr did a great job fixing the problems but by accident deleted the last post (it’s still on LJ so I am totally fine with that… and he saved well over 800+ old posts). Towards the end of the month the Mr is going to move all of the web sites over to GoDaddy. This site wont be affected but amubleu.com and my email will. So before he starts anything I’ll be sure to contact people with my gmail and or aol addresses. In the end it will all be worth it and I know that the Mr will do an awesome job. I would be totally clueless and helpless with out him when it comes to web stuff. I am terribly grateful. Seriously, how cute is that? After waking up this morning the Mr saw these out blocking and said “they are some tiny sweaters”. I have this fascination for all things tiny especially when I see the larger version all the time. So I couldn’t resist. I tend to make cozies for ever thing I own like new electronics or anything I feel that needs covering up. All of the boys get at least one of their own in sweater form(except Hito who owns an insane amount). I’m having so much fun making these little guys that after finishing my pattern I made one for three different collar styles. This one is a v-neck (though, it may be hard to tell from the photo). I may have a selection of these at Katsu next month. I’m so happy with the fit. The neck line lays perfectly and the sleeves drape so nicely despite the change in the density of the fabric. The only issue I have is the fact that head removal is a must in this size (these guys are so bobbled headed). I don’t mind that and even prefer it over velcro and snaps in the back (D:personal pet peeve… like over sized buttons) but I know that not everyone is fond of this. As I said I may make a few and see how they go *shrugs. It’s kind of hard to stop knitting them. 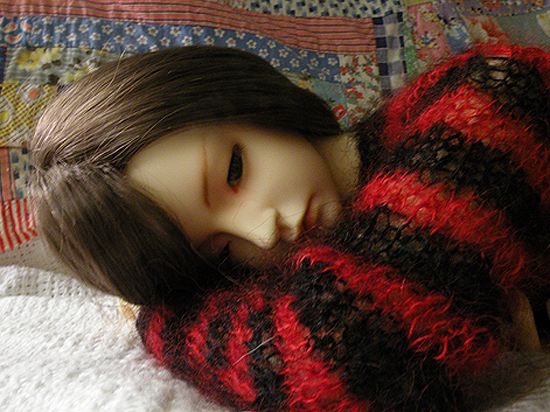 I’ll have photos of Yoshi-kun wearing his soon once his wig and clothes get here. They are all on there way so I should have him all set next week. Tiny little sweater for a tiny little guy. I’m feeling rather sentimental over this boy today. It was one year ago today that I was sitting at my kitchen table carving away while I was waiting for the cable guy to pick up our cable box, hahaha (one year of no tv, btw). When I read back I sounded so horrible. This head really was an experiment that I really did not intend to use as Hito’s regular head. Yes, “Hitomu”, or “the Drayton” as he was called for the longest time, was around for a while before this guy settled in as my favorite. I don’t know how it happened or why but I try not to question things that bring me happiness or help the creative juices flow. There isn’t a day that goes by that this little man doesn’t inspire some idea or project, be it for the dolls or myself. He reminds me of how much I love this hobby. For his first year I finished the v-neck for him. It’s hard to tell but I made a slight change since the sneak peek. I frog the collar back and reknit the last row, knitting the two center stitches together to add a little shaping. It shortened the collar a little bit but the pattern allows me to adjust the depth with no problem at all. I’m making another sample for the commission page with some minor changes. I’m using a new color that I haven’t shown off yet called blood… very pretty. While I wait for a commission piece to dry, all I really have to say right now is “Yes!” I finally made an attempt to make a v-neck style Takumi Sweater and it’s looking alright. I need to work out a few bugs. I do like the webbing effect that it created. Certainly not done in the most traditional process but I’ll do anything to get a specific result. 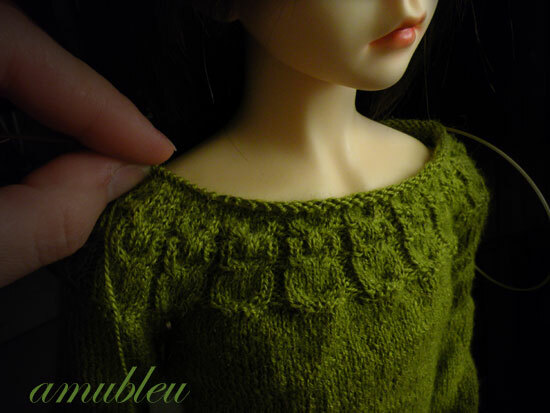 Kristi (alanna214) has done some fantastic examples of v-neck doll sweaters. I believe she uses a more traditional approach and they are just flawlessly done(though, I think she’ll argue with me on that, but I still stick to my word on the subject). She definitely has more patience than me. Just a quick note to myself about this sweater: I think I finally worked out a way to use the Kitchener stitches with less bulk… YAY! This sweater is far from done. 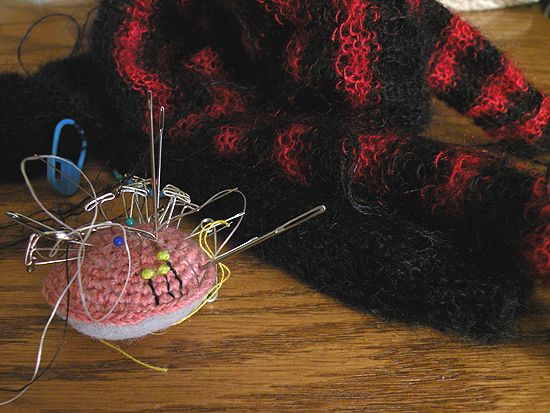 It need to be washed, blocked and the ends need to be woven in… It will smooth out any obvious flaws that are showing. I think the only reason it looks as good as it does is for the fact that the Muse if wearing it. Speaking of Muse, it seems that his bday is coming up very soon. In a few days as a matter of fact. Who knew that a little junk cast that started out as an experiment would take over. That was totally not my goal when I started this blog. I can’t help but <3 Hitomu. Cross posting this photo to the daily as well. Yeah I managed to actually take some photos that I don’t mind… but only after getting some help with photoshop. The mr taught me how to use a few new tools in the program so it will be another thing to over use until I learn something else. no doll pics tonight. sorry about that. instead you get a peek at a commission i’m finishing up and my tiny pin cushion that seems to be terribly over loaded at the moment. 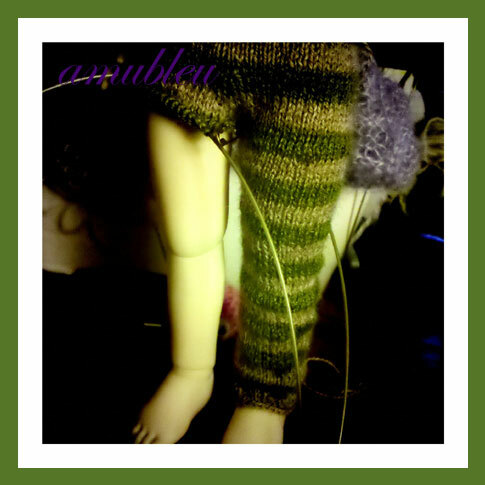 the two sweaters above just need to have their ends woven in. after that, they’ll have a good washing and blocking, then i’ll have hito model them. the red and black you’ve seen before but the solid black is somewhat new. at least with this collar style. it has the shaped neckline. i think that is my favorite of the all three neckline styles. i can not wait to see how it looks in black. i finally up loaded photos of my yarn swatches for the commission page on doa. i didn’t realize i had so many colors. i also just realized that i need to restock several if i want to make some for nekocon-_-. again, another lovely from robin’s egg. it was never really a favorite sculpt of mine but when i see it modded like this i just can not help but go back and look (and weep TAT… so pretty). there is a modded swd school a on the market place now that resembles this one so much. i’m so very tempted but i just can’t justify it(they want a lot for it… and rightfully so. it is beautiful). i’m also very tempted to get an unmodded one and try to mod it myself. i have no issue with the eyes but i’m not sure how i would go about modding the mouth. oh well, someday i suppose. 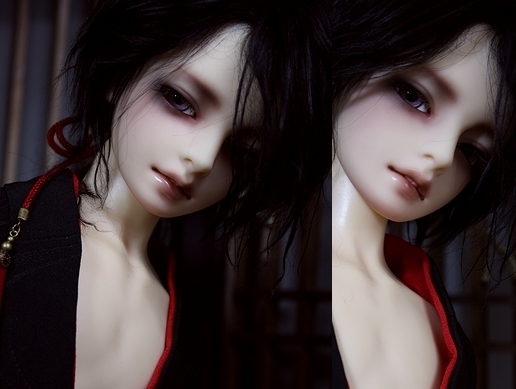 hito is not really a black and red stripe type of guy. he thinks it a bit too emo for his taste. i still made him try the sweater on for shits and giggles. … very pretty. 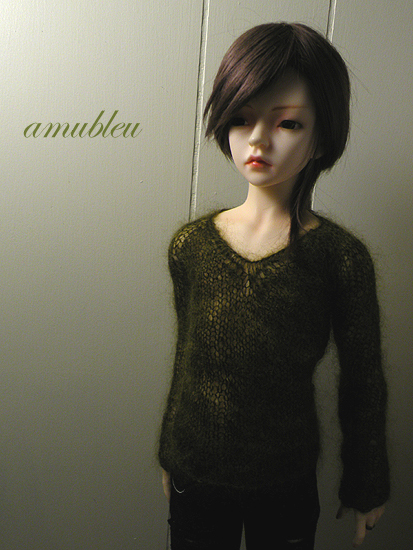 the sweater is for a sample i promised someone. it’s the first project that i’ve been able to work on since the con ended. i’m so happy with the results. this one is staying with me. mainly so that i have a reference for later when i go to make others and also for the fact that my boys (especially the one that i was intended for) looks awesome in it. 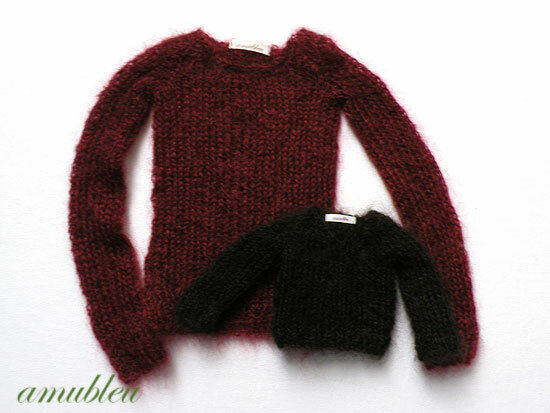 so while i wait for a response about this sweater, my next sweater is one for the classic style dollshi. one that i’ve been planning to do for a very long time now. that will be a fun one.